My name is Simón Anibal Ruiz Rolfs, and I'm an Ubuntu user. I was born and raised in Venezuela, and am a member of the Venezuelan Ubuntu Fraternity. I'm also a co-founder of the IndianaTeam Ubuntu Indiana Local Community where I currently live in Fort Wayne, Indiana, United States of America. 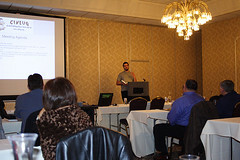 I'm also very active in the local LUG here, the Fort Wayne Linux User Group. I blog semi-regularly about my experiences at http://indianalinux.blogspot.com. My most popular posts are the detailed HOWTOs I write after overcoming particularly challenging technical problems. 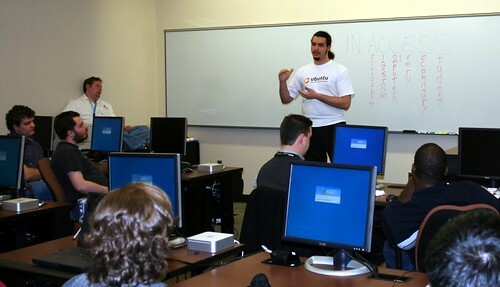 Ubuntu & Education Team charter member. Some of my earliest memories include playing with my old green-screen Epson QX-10 computer, and I can't recall a time in my life when I didn't have a computer in my home. I've only relatively recently gotten into Linux, at about the release of the Breezy Badger, but it was quite the slippery slope, and there's little hope I'll ever find my way out. My love affair with Ubuntu began when I was the Technology Assistant at Bloomington High School North. Our school was one of the pilot participants in the inACCESS program which is a revolutionary initiative by the Indiana Department of Education that is bringing Linux to high school classrooms in 1:1 computing environments (which is to say, each student has their own computer the entire time that they're in the classroom). The distribution we chose to use at North, at my insistence, was Ubuntu. As the official corporate IT department was understaffed, and worked exclusively on proprietary software system up to that point, I took responsibility for providing the necessary technical support to keep our new Linux classrooms running. Quite soon after beginning my life with Linux, I was amazed to find the truly awesome community that Linux, and Ubuntu in particular, have. 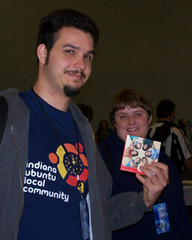 I joined the Bloomington Linux User Group, and was one of the first members in the Ubuntu and Education team. Near the end of my time at North I co-founded the IndianaTeam, as one hadn't yet been created, and it was about time one was. In large part due to my work with Ubuntu, I was willing and able to take an opportunity I could not resist and moved to Fort Wayne, Indiana to begin working at Canterbury School as a teacher and as the Senior Technology Specialist. Canterbury School has a few classrooms built on the model of inACCESS, all running Ubuntu, and the majority of our server back-end is Ubuntu. I've been working there every since. No day is boring when you work with kids or technology, much less both. I gave a presentation geared at very beginners for the Bloomington Linux Users' Group], part of which involved walking my then uninitiated fiancée through an install of Ubuntu, which I videotaped and made available for download from my blog. (Pictured above) I was asked to officially represent Canonical/Ubuntu with a short talk at a Central Indiana Linux User Group meeting. I helped run a full-day tutorial at the Hoosier Education Computer Coordinators Conference, giving people new to inACCESS a taste of the Linux Desktop. Soon after arriving in Fort Wayne, I gave a presentation about all the cool, new features of Feisty Fawn at the Fort Wayne Linux User Group. It was well received. (Pictured above as the room began to fill) Vern Ceder (Boss and fellow IndianaTeam and FWLUG member) and I gave a presentation at the Open Minds Conference introducing people in the Education world to the wide range of Community Partnerships that abound in the Free Software world.